The sparkly black dress was back and, like the tennis that its owner produced on Arthur Ashe Stadium in the third round of the US Open, the sparkles flickered on and off under the lights. 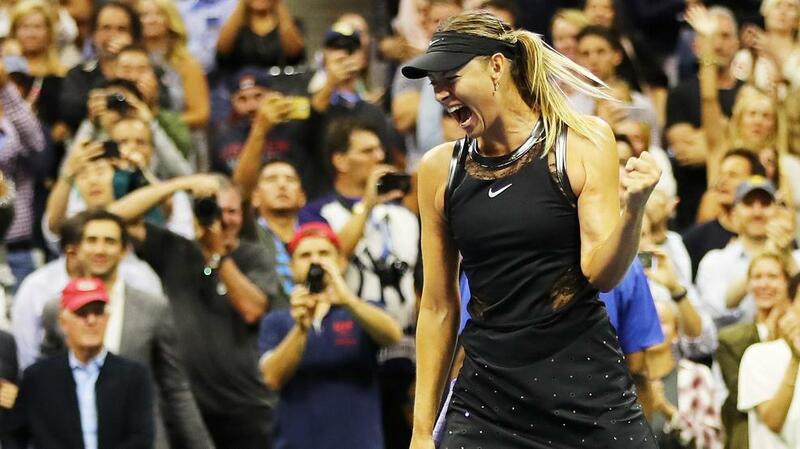 Returning from a 19 month absence from Grand Slam tennis, Maria Sharapova played well enough against an excellent 18-year-old called Sofia Kenin, who, ironically, is also an American who was born in Russia, to gain an entertaining 7-5, 6-2 victory. In a women’s singles draw that is open to all kinds of possibilities, Sharapova is obviously one of those in the round of sixteen who could win the title. And that, to put it mildly, would be quite a story. Unhappily, it would be a story that would focus to an unreasonable degree on the fact that Sharapova received a 15 month ban for using a newly banned drug called Meldonium at the Australian Open in 2016. The furor that has surrounded this incident is, to a large extent, inevitable, considering the luminosity of Sharapova’s fame and her status as one of the great female athletes of her generation. But there continues to be a nasty edge to this story which has almost everything to do with the fact that Sharapova’s unpopularity in the locker room has created criticism of an especially bitchy nature. A number of players have condemned her as a deliberate drug cheat of long standing, a charge that doesn’t stand up for two reasons. Secondly, it would be difficult for her to be a ‘long term’ cheat for use of a drug that had only been on the banned list for a matter of days when she used it. But such is the animosity towards her that some players insist she knew Meldonium, or Mildronite as it was called, was performance enhancing and only took it for that reason. In other words, they want to pretend that something which was legal, was illegal. The argument would be more reasonable if someone could produce a player who did not seize on anything that might, in any way, assist their performance as long as it was legal. Caffeine in quantity was banned until 2004 but is now legal. (That may change). So is anyone who pours a few cups of coffee down their throat before playing – as many do – “shaming the sport” as one writer suggested Sharapova had done with her long term use of Mildronite for a proven medical condition? I think not. Groenveld, one of the most popular and respected coaches in the game, would have been inundated with financially attractive offers if he had left her. But like the rest of her team, he stood by her through 15 not-always-easy months. If Sharapova had kept her counsel for a little longer, she could have told WADA that she had taken the last dose of Meldonium on, say, 29th December 2015 and they would have been none the wiser. Once again the WADA committee had not done their homework – the same was true in the Nandrolone case several years before – and did not have a clue how long Meldonium stayed in the human body. Several of the more than 100 Eastern European athletes who had been taking the over-the-counter drug used this excuse as an out and had their penalties reduced. When I interviewed Sharapova back in March, I started to ask her if she had ever thought of trying this escape route but she cut me off mid-sentence. “No, no I would never do that,” she insisted. “That’s not me. I made a big mistake and I had to pay for it.” I think that’s called taking ownership. Since her return, the wild card issue has been a non-stop issue. A surprising number of people in the game feel that she should be punished further by not being offered wild cards into events and made to work her way back from a zero ranking. I find this strange on two counts. Firstly, tournaments are thirsting for ticket-selling stars and, quite understandably, want to make use of Sharapova’s marketability at the first opportunity. Secondly, it would seem odd to me if a person, having just completed a prison sentence and offered a job on release, would turn it down, bashfully insisting that it was too soon. Sharapova has every right to accept whatever is offered her and has never complained when wild cards have been withheld. The French Federation refused to give her one for Roland Garros and it was easy to see why. The IOC evaluation committee for the 2024 Olympics was in town at the exact moment when the decision had to be made. Nothing was going to jeopardize the ultimately successful Paris bid. The All England Club went half way and offered her a wild card into the qualifying. Sharapova immediately agreed to play but then got injured. And there was no reason for her to go all coy and refuse when the USTA gave her a pass straight into the main draw at Flushing Meadows. But the rumbling went on. Critics said it was unfair to take someone else’s place in the draw – a someone, presumably, who had not won 5 Grand Slams and sold more tickets than anyone in the women’s game other than the absent Serena Williams. But that was not enough. After she had lost to Ekaterina Makarova in the second round, Caroline Wozniacki, a charming, popular member of the tour, suddenly unleashed all her frustrations at having reached six WTA finals this year and lost them all, by lashing out at the fact that Sharapova had been scheduled on Arthur Ashe Stadium for her first two matches. Although she didn’t explicitly say so, the target of her attack was obvious. She wasn’t aiming at the Order of Play Committee or ESPN who are rather keen about ratings. Her criticism inevitably lodged in Sharapova’s lap. What matters to Maria Sharapova is winning. Soon, if she continues to win while not playing her best and then steps it up, she will soon have enough ranking points to put the wild card controversy to rest. Along, one hopes, with everything else.